MAGP2 antibody LS-C18845 is an unconjugated rabbit polyclonal antibody to human MAGP2 (MFAP5). Validated for ELISA and WB. MFAP5 / MAGP2 antibody was raised against synthetic peptide from human MFAP5. A region near the carboxy terminal end of human MAGP-2 protein. This affinity-purified antibody has been tested for use in ELISA and western blot. Specific conditions for reactivity should be optimized by the end user. Expect a band approximately 20-30 kD in size corresponding to MAGP-2 protein by western blotting in the appropriate cell lysate or extract. 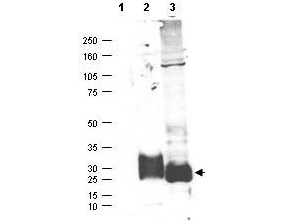 Anti-MAGP-2 Antibody - Western Blot. Western blot of affinity purified anti-MAGP-2 antibody shows detection (arrowhead) of secreted MAGP-2 (lane 2) and MAGP-2 present in a MAGP-2 transfected HEK293 lysate (lane 3). No staining is detected in supernatants from non-transfected cells (lane 1). After SDS-PAGE and transfer, the membrane was probed with the primary antibody diluted to 1:100 in TBST with 5% BSA overnight at 4C. Personal Communication, Micheal Birrer, CCR-NCI, Bethesda, MD.